SAN DIEGO, Calif., Oct. 23, 2018 /Christian Newswire/ — To help parents answer the uncomfortable questions about sexuality that today's society forces on children, Catholic Answers Press has published Made This Way: How To Prepare Kids To Face Today's Tough Moral Issues by Trent Horn and Leila Miller. "As our culture continues to publicly air and celebrate every form of deviance, we have no choice but to equip our kids to understand and to own the truth about such issues," said Todd Aglialoro, Catholic Answers director of publishing. "We broke the book down into ten hot-button moral topics," Miller said. "Each chapter includes, first, what the Church teaches on that topic; second, how to talk to younger kids about it; and, third, how to talk to teens." Horn adds that although the book can be read in chapter order, its structure also allows readers to "flip to whatever section they need in a particular moment." Though it's honest and direct in treating these tough issues, Made This Way seeks to uphold childhood innocence. "Rest assured, we are very careful to help folks protect the natural innocence of small children with what we advise to tell them," Miller said. 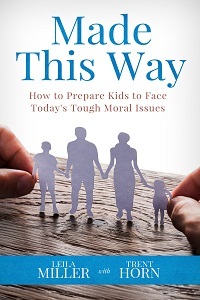 Parents, educators, and clergy often need help articulating tough moral issues in practical terms. They can also benefit from a more thorough understanding of today's leading moral topics. "Made This Way allows the adults themselves to become more acquainted with the rich natural law tradition, thus enabling it to be shared with a new generation," said Robert Cardinal Sarah, prefect of the Congregation of Divine Worship and the Discipline of the Sacraments. Miller is the mother of eight children. In her childrearing, she said, the natural-law approach to teaching morality has proven to be the most sensible. "It just seemed to me that the best way to keep our children Catholic was to make sure that the world—and Christianity—made logical sense to them," Miller said. "If something makes sense, kids will accept it and stay with it." "We hope Made this Way will inspire parents and others to be confident in their explanation of the Faith," Horn said, "and that it will keep young people from abandoning the faith—not just in college but even in middle and high school." Catholic Answers is the nation's largest lay-run ministry of Catholic apologetics and evangelization.